The Al Roker Diet is described in this TV personality’s new book, Never Going Back. Al Roker has been a long time host of NBC’s The Today Show and weighed close to 350 pounds a decade ago. He had gastric bypass surgery and lost 190 pounds, however, the pounds started to creep back on due to the sickness of his father. At 50 pounds rebound, he made his dying father a promise that he would lose weight and get healthy. However, he knew he needed to formulate a successful plan to lose the weight again and keep it off for good. Despite the initial gastric bypass surgery, Al Roker still struggled to keep weight off. He says that he has devised a plan that just has a few simple rules and this plan has helped him lose the rebound weight and control his binge eating. Al says that the scale is his best friend and he weighs himself twice a day, once in the morning and once in the evening. Al likes to jumpstart his diet with a detox cleanse. He initially did a 28 day detox at the beginning of his weight loss journey, where he eliminated caffeine, alcohol, sugar, dairy, and gluten. Al lost 28 pounds in 28 days. He continues to do shorter detoxes after holidays or other events that caused him to eat too much. The majority of the Al Roker Diet consists of only consuming whole foods, while avoiding anything that’s processed or unnatural. His diet is high in protein and low in carbs. Al enjoys fruit smoothies, salads, fresh meats, legumes, and lots of vegetables. He keeps an eye on his portion size, but generally keeps things pretty simple. He says that counting calories or adding up points just doesn’t work for him and his busy lifestyle. Al Roker believes that each person must know their weaknesses or diet pitfalls and have a plan in place to deal with them successfully. He believes this is a vital key for anyone that wishes to remain successful long-term. Exercise is a huge component of the Al Roker Diet since he believes building muscle mass helps burn fat. Al works out 3 days a week using the Slow Method made popular by trainer, Melissa Li. This also found in the book The Slow Burn Fitness Revolution, which is what Melissa bases her training on. Consists of all strength training exercises. Each rep takes 20 seconds to complete. Muscles reach exhaustion in under 2 minutes. Safety and proper form are key. The Slow Method is especially useful for the elderly or those with disabilities since safety is key and lower weight is required for each movement compared to traditional strength training. Al Roker: Never Going Back retails for $26.95. Besides general weight loss advice, Al also shares some of his favorite healthy recipes. Here’s just one from the book. 1. Heat grape seed oil in a skillet and add onion and pepper. Sauté for 5 minutes or until vegetables are tender. Season with sea salt, pepper, and cumin. 2. Stir in egg and scramble everything together. Cook for 3 to 4 minutes. Right before eggs are set, stir in cilantro. 3. Shut off heat and allow eggs to finish cooking from heat of the pan. 4. In the meantime, heat up tortilla by placing right over low heat. Give it about 20 seconds or so on each side until warmed through and slightly charred (you can also put the tortilla in the oven on low heat). 5. Fill tortilla with scramble and top with freshly diced avocado. Cut in half and serve. 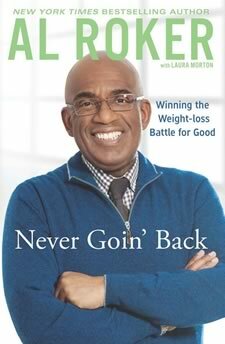 The Al Roker Diet described in the book Never Going Back is an enjoyable read and many people will be encouraged and inspired by Al’s personal struggle with obesity. While this book isn’t a detailed diet plan, it does offer plenty of tips and suggestions to assist others in following the guidelines Al Roker used/uses to maintain his weight.